Find the best unique wedding favours or your functional party gifts for weddings, showers, parties, corporate events and other special occasions. "Sweet Treats Collection" Cupcake Towel Favor. These cute puppy towel favors will be a hit with your guests for your next baby shower or baby's birthday. Each Blue puppy dog shaped towel is made of 100% cotton. This great pink puppy towel favor is a great giveaway for your next baby shower, or baby's birthday. This metal bottle opener is a gift for your fall wedding out autumn themed party. Come gift boxed with ribbon and for you tag. A must have for your destination wedding, this amazing flip flop luggage tag is a perfect gift for your guests. Come's gift boxed with a for you tag. Our many-faceted chrome bottle stopper favor with a crystal heart is truly romantic, any way you look at it. Exclusively from the Choice Crystal by Fashioncraft line. This amazing coloured bottom votive glass measures 3oz and comes in many colours. The votive glass are a perfect favour for any event. The Murano art Deco design cake server with it's blue and white swirl design will fit perfectly for your next wedding, bridal shower or anniversary. A must have for your outdoor wedding or special event. Your guests will love the silk fan favors on the hot days. If you looking for a classic glass jar to brand with your own design look no further! Add a fabulous touch to your next event and give each guest a jar filled with goodies with a stunning personal sticker on the front. They will love the idea! One of our most popular bridal shower themed favors are the heart shaped whisk. Favor comes packaged in a decorative box and a thank you tag. These Heart Shaped Measuring Spoons add Love Beyond Measure® as wedding shower favors, wedding favors and more. A great pair of sunglasses finishes off that fashionable look and these are fun and trendy! Add a fun element to your event when you give your guests a pair of sunglasses that are modern and chic in a hot pink show-off color. This giant 15oz stemless glass is a perfect giveaway for your next wedding, anniversary, birthday or any special event. The glass comes screen printed with your image and choice of print. These rose gold frames are a nice way to show off your wedding photo's or a great gift. 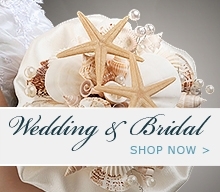 Our stunning Murano starfish bottle opener is a great favor for your wedding or beach themed party. The bottle stopper comes topped with a solid glass charm in the shape of a starfish, in a rich blue with metallic gold and black stripes. The musical notes bottle stopper is a great favor for your wedding or musical themed party. Each musical note bottle stopper comes with a ThankYou tag and white ribbon. This personalized sleek design shot glass is a great glass for all types of drinks. Personalized with your specail message or logo. This low cost glass has a great print area for your next wedding, birthday, or specail event. Printed highball glass with your choice of colour and fonts.